Burkitt lymphoma (BL) and diffuse large B-cell lymphoma (DLBCL) are the two most common subtypes of mature B-cell lymphoma seen in childhood. They account for 50–60% of pediatric NHL. 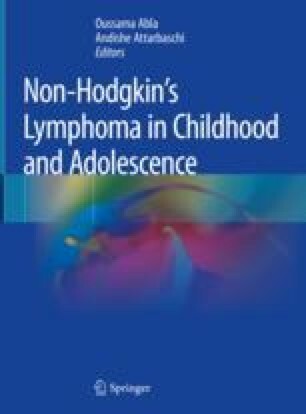 Despite differences in biology, childhood BL and DLBCL are treated similarly. Dramatic improvements in outcomes have been made over the past 60 years as a result of sequential cooperative trials administering multi-agent, risk-adapted chemotherapy. The inclusion of immunotherapy in recent trials has further improved outcomes. Despite an overall survival greater than 90% for all patients, short-term toxicity remains substantial with current intensive regimens and outcomes for those with relapsed disease remain poor. Recent advances in molecular and genetic diagnostics offer the opportunity to define and classify disease more accurately. This improved understanding of disease biology enables the development and application of targeted therapies, potentially allowing for substitution of cytotoxic therapy by more specific, less toxic agents, as well as improvement of outcomes for those with refractory disease. Future well-designed collaborative trials are vital to build upon the successes made in the treatment of children with mature B-NHL.